The Kansas City Royals are on the brink of their first World Series title in 30 years after they beat the New York Mets 5-3 in game four on Saturday. The Mets had led 3-2 at the top of the eighth after two home runs from rookie Michael Conforto. But an error by Mets second baseman Daniel Murphy, on a slow roller by Eric Hosmer, signalled the start of a fightback by the Royals. They can win the title at Citi Field in game five on Sunday night. 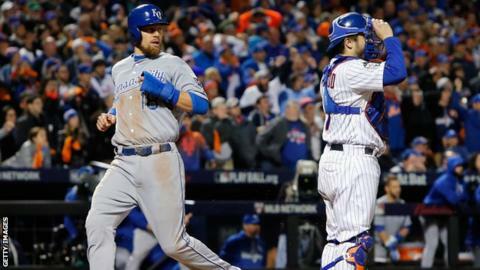 A Mets win would send the series back to Kansas City for game six on Tuesday. "That's just what our team does," said Royals manager Ned Yost, after his team edged closer to their first title since 1985. "We feel like if we can keep the game close, we're going to find a way to win it." Mets manager Terry Collins said: "We're in a tough situation but we're not dead yet."